Locking yourself out of your home is bad enough, but locking yourself out of a car provides such a strong feeling of helplessness. There's your vehicle right in front of you, and you can't get in without hiring professionals, which is a hassle and takes time. If you need to urgently get back into your car and you're not afraid to go for a bit of a daring maneuver, YouTuber Petr Kolarik has a great idea to pop open your car door's lock from the outside. Now, this will only work with older cars that have the up-down lock near the window. Fasten a piece of lace — something relatively strong — into a knot, but leave a loop there instead of completely pulling it out. Now, insert it into your car door like in the video below and guide the loop around the lock. Pull hard on both ends of the string so the loop tightens onto the lock, and pull up. Presto! 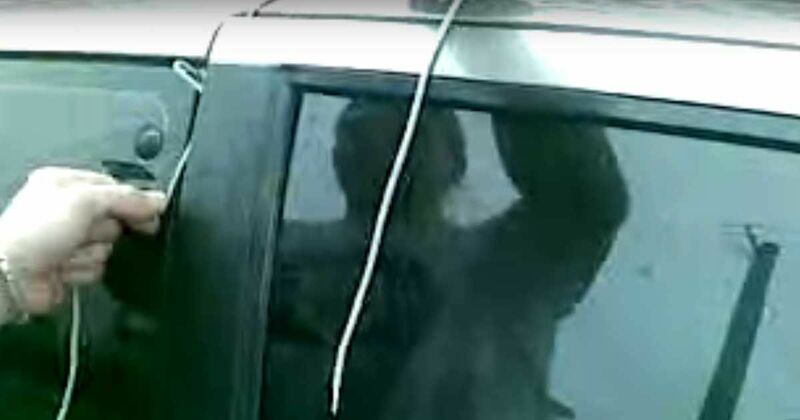 For all the pessimists out there, it's worth nothing that this is a fairly difficult and time-consuming way to illegally break into a car, and that breaking through the window is generally much easier. Blue Collar Workman and Captain Laurence D. Nodiff of the Philadelphia Police Department both agree: If someone wants to break into your car, they will, no matter how aggressive they have to be. But the blogger behind Blue Collar Workman does say that most car thieves will only give themselves a minute to break in and disappear. This method is a little too convoluted for such a tight time frame. What both websites do recommend, if you want to avoid break-ins in the first place, never, ever leave anything lying around in your car. Even small change sitting in your cupholder can be enough of an excuse for someone to break your window. Leave your car as empty as possible! With all that aside, this is a great way to get access to your car if you locked yourself out. Make sure to share this tip with your friends on Facebook.